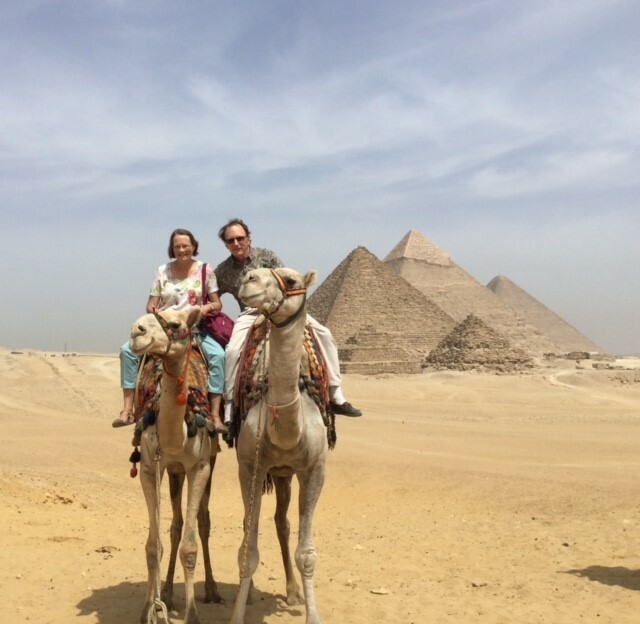 LAND only Tour: $3,999 Canadian/person Starts & finishes in Cairo, Egypt. AIRFARE: Our flights specialist estimate the cost of the airfare to be approximately $1,500 Canadian departing Vancouver to Cairo ( & returning from Cairo.) PLEASE NOTE THIS IS AN ESTIMATE FROM VANCOUVER ONLY VALID AT THE TIME OF POSTING. Our LAND tour begins this evening in the Giza area of Cairo, close to the Pyramids. First of 3 nights in Cairo. Le Meridian Pyramids Hotel or similar. No meals. This morning we visit the Egyptian Museum with its collection of thousands of priceless artefacts from Ancient Egypt. Of course, the most famous pieces in the museum are those which were found in the tomb of the boy king Tutankhamun, including the solid gold death mask. This afternoon we visit Old Cairo (also known as Coptic Cairo) where we explore the narrow streets and visit some of the Coptic (Egyptian Orthodox) churches found within the city walls. One of the churches is reputed to be built over a cave where the Holy Family rested during their flight to Egypt. We also visit the Ben Ezra Synagogue. Second of 3 nights in Cairo. Le Meridian Pyramids Hotel or similar. Breakfast & Dinner. This morning we take a guided tour of the Old Kingdom capital of Memphis where we see a gigantic statue of Pharaoh Ramses II. At the Old Kingdom burial site of Saqqara, we see the Step Pyramid of King Zoser, a precursor of the Great Pyramids. Third of 3 nights in Cairo. Meridian Pyramids Hotel or similar. Breakfast & Dinner. This morning we visit the Pyramids and Sphinx. Built around four and a half thousand years ago, the Pyramids are the only monuments of the Seven Wonders of the Ancient World which are largely intact today. This afternoon we drive north through the desert to the Mediterranean coast and enter Egypt's second largest city - Alexandria. Today Alexandria is a city principally of 19th and 20th-century buildings but it is built over what was one of the most important cities in the Greco-Roman world. Founded by Alexander the Great in 331 BC, the city grew in size and stature under the Ptolemies - the Greek-speaking rulers of Egypt for the next 300 years. Alexandria was a famous centre of learning and housed the most important library in the Ancient World. Overnight in Alexandria. Paradise Inn Le Metropole Hotel or similar. Breakfast & Dinner. Today we tour Alexandria's important sites from the Greek and Roman eras. We include a visit to the Catacombs which descend three levels underground and include some beautifully decorated tombs which combine Roman and Egyptian decorations in a unique way. We visit the Bibliotheca Alexandrina library, a 21st Century version of the great classical Library of Alexandria. Included are three museums and five specialized research institutes. We also visit Pompey's Pillar. Originally from the temple of the Serapis, it was constructed in honour of Emperor Diocletian. Later this afternoon we drive back to Cairo. Overnight in Cairo. Le Meridian Pyramids Hotel or similar. Breakfast & Dinner. First of 2 nights in Aswan. Movenpick Resort or similar. Breakfast & Lunch. This morning we take a guided excursion to the Aswan High Dam which was started by the Soviets but finished with Western aid in 1964. The dam has drastically affected many aspects of Egyptian life by controlling the flow of the Nile and creating the enormous Lake Nasser. We will also cross the Old Aswan Dam built by the British in the 1890's. From the very earliest times, Aswan has been the source of a special pink granite used in statues for thousands of years. We visit one of the ancient quarries to see the Unfinished Obelisk, a monument abandoned in situ when it broke while being carved out. Also this morning we take a motorboat out across a lake for a guided tour of the beautiful island Temple of Philae. Later this afternoon we take a motorboat ride to visit the local Nubian people to see how the ordinary people of today's Egypt live in their simple villages. This morning we get up early and drive from Aswan through the desert to Abu Simbel. At Abu Simbel, we see two huge temples which were built in the 13th century B.C. and dedicated to Ramses II and his favourite wife, Nefertari. 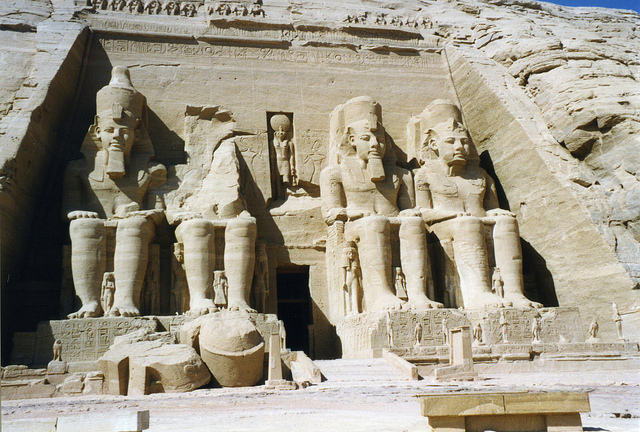 The four enormous seated statues of Ramses are among the most famous images of ancient Egypt. The interior of the Ramses temple is also fascinating and is being decorated with images of the Battle of Kadesh fought between the Egyptians and the Hittites of what today is Turkey. The two temples are carved out of the solid hillside and so the task of cutting them up, moving them piece by piece and reassembling them in the 1960s is considered one of the marvels of modern engineering. We board our luxurious cruise ship in time for lunch. The rest of the afternoon is free for you to relax by the Nile or explore Aswan’s lively markets. 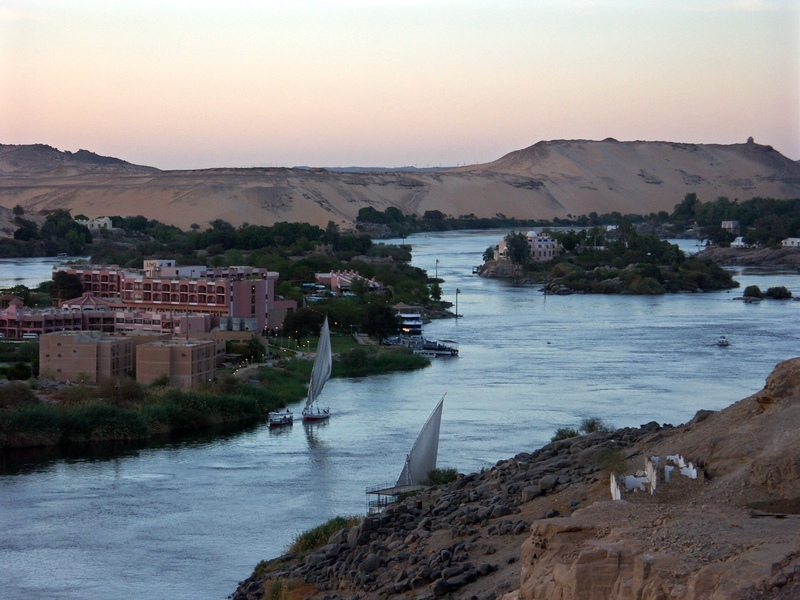 Leaving Aswan early this morning, we make our way down the Nile to the famous temple of Kom Ombo. This is an unusual temple in that it is dedicated to two Egyptian gods - Horus the falcon god and Sobek the crocodile god. One interesting frieze shows ancient birthing and other medical techniques. Our guided tour also includes the Nilometer, a well-like structure used to measure the bounty of the Nile and as a way of setting tax levels. Reboarding our cruise ship we set sail again, enjoying breakfast and lunch as we glide by the riverbank villages that have changed very little since Pharaonic times. This afternoon we take horse-drawn carriages for a guided tour of the gigantic Temple of Edfu, the most perfectly-preserved temple in Egypt. Although built by the Greek-speaking Ptolemies between 237 BC and 57 AD, the temple building and decorations are in the ancient Egyptian style. This evening we pass through the locks at Esna and continue cruising down the Nile, with the lights of the villages twinkling all around us, to Luxor. Second of 3 nights on our 5-Star cruise ship MS Living Stone or similar. Breakfast, Lunch & Dinner. 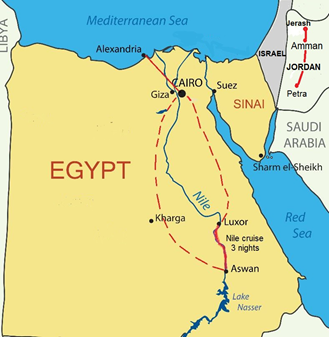 Starting out early this morning, we travel across the Nile to the West Bank, the location of the tombs of the great pharaohs of the New Kingdom. We take a guided tour of several of the most important tombs in the Valley of the Kings. We also have a guided tour of the funerary temple of the first woman to rule as a pharaoh, Queen Hatshepsut. Some of the most interesting painted scenes in the temple are of a trading expedition she mounted to the Land of Punt on the Red Sea coast. On our way back to the Nile we stop to view the gigantic Colossi of Memnon statues where new excavations have discovered the remains of vast funeral temples. We return to our cruise ship for lunch and have the afternoon to relax. This evening we have a guided tour of Luxor Temple by night. As with most Egyptian temples, this temple is really a series of buildings begun by one Pharaoh (in this case the 13th century BC Pharaoh Amenhotep III) and added to by several subsequent rulers. Third of 3 nights on our 5-star cruise ship MS Living Stone, or similar. Breakfast, Lunch & Dinner. This morning we have a guided tour of the Temple of Karnak. This is a vast complex of buildings added to and rebuilt over thirteen centuries but reaching its apex during the New Kingdom period when the capital of Egypt was located in Thebes (today's Luxor) and the temple's main god, Amun-Ra, was made the state god. One of the most impressive sections of the temple is the Great Hypostyle Hall with its 137 huge columns. After our tour, we transfer to our hotel in Luxor. The rest of the afternoon is free for you to relax by the Nile or explore Luxor. Alternatively, you may wish to visit Luxor's excellent museum. 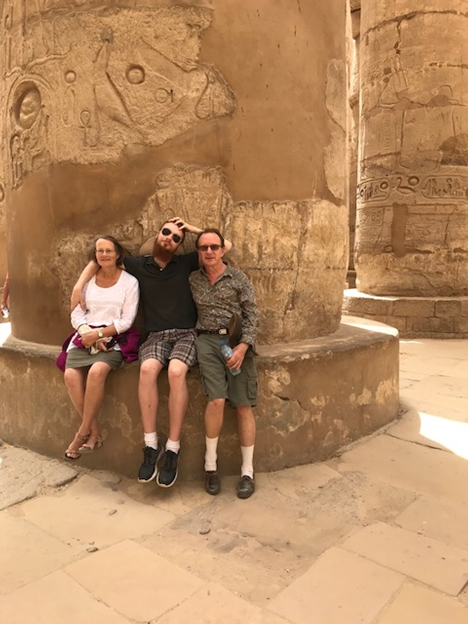 This evening you might like to join our OPTIONAL tour to the English version of the sound & light show at Karnak Temple. Overnight in Luxor. Steigenberger Nile Palace Hotel or similar. Breakfast & Dinner. This morning you are free to relax or explore Luxor's shops for some of the wonderful bargains in gold, Papyrus paper, cotton, leather, and other unique Egyptian souvenirs.Late this afternoon we fly from Luxor to Cairo, but for this visit, we stay close to the airport. Overnight in Cairo. Radisson Blu Cairo Airport Hotel or similar. Breakfast & Dinner. Today we fly from Cairo via Europe to North America, arriving the same day. Please note that our Nile Cruise schedule may force us to see the above-noted sites in a different order than we have listed here. We will, however, see them all. Our LAND tour begins this evening in Jordan’s capital, Amman. First of 3 nights in Amman. Geneva Hotel or similar. No meals. Driving north from Amman we tour Jerash, one of the finest examples anywhere of a Roman provincial city. We enter the city by the elaborate gateway known as Hadrian's Arch and make our way to the Forum. Walking along the Colonnaded Street you can still see the grooves worn by the Roman chariot wheels. Near the ruins of the immense Temple of Zeus, we enter the South Theatre which was one of three theatres in Jerash and could seat 3,000 people. On our guided tour of Jerash, we see the remains of many important buildings from Roman times including the Temple of Artemis and several Roman baths. We also see later Byzantine churches including those of St John, St George, and St Theodore. Second of 3 nights in Amman. Geneva Hotel or similar. Breakfast & Dinner. This morning we descend into the Jordan Valley and make our way to the shores of the Dead Sea - the lowest point on the surface of the Earth. Small, seasonal streams and the River Jordan flow into the Dead Sea bringing in water plus minerals but no rivers flow out. Thus, water leaves the Dead Sea only by evaporation, leaving behind the minerals which over the millennia have concentrated to the point where the Dead Sea is the 'saltiest' major body of water in the world. Those who wish to may take a float in the Dead Sea (the water is too buoyant for swimming!) or try smothering onto their skin the mud from the lake, which is supposed to have many therapeutic properties. Returning to the city this afternoon, we take a driving tour of the main highlights of Amman, including the Citadel Hill with the remains of a Roman Temple dedicated to Hercules and a small but excellent Museum. From the hilltop, we can look down at the Roman theatre, which could seat 6,000. We also drive through some of Amman’s very expensive neighbourhoods. Third of 3 nights in Amman. Geneva Hotel or similar. Breakfast & Dinner. We travel today down the ancient trading route known as the King's Highway. Our first stop is the town of Madaba, famous for its mosaic floors. Especially important is the mosaic map found in the floor of the Greek Orthodox Church of St George. Laid around 560 AD, this is the earliest surviving mosaic map of the Holy Land. From Madaba, we drive to Mount Nebo, from where Moses and the Children of Israel first looked down on the fertile Jordan Valley. On a clear day, we can also see the Dead Sea and the city of Jerusalem. We visit the 6th-century Monastery of Syagha dedicated to Moses by Egyptian monks. Further along the King's Highway, we drive down into the huge gorge of the Wadi al-Mujib (known as 'Jordan's Grand Canyon') and up the other side. First of 2 nights in Petra. Petra Moon Hotel or similar. Breakfast & Dinner. Today we have a full day of guided sightseeing at Petra, one of the most spectacular archaeological sites in the world. We enter the site via a long, narrow gorge known as the Siq. At the end of this gorge, we suddenly emerge in front of one of the most beautiful buildings in the world, the Treasury ( El Kazneh.) Continuing into the site you have an opportunity to climb to the High Place where we believe human sacrifices took place. On the lower level, we pass an amphitheater which could seat 8,000. Entering the main valley where the city of Petra itself was located we find the remains of the Colonnaded Street, the Temple of the Winged Lion and the Great Temple. Above the valley, we can explore the most substantial group of tombs, including the Urn Tomb, the Silk Tomb, and the Corinthian Tomb. At the far end of the valley are the Triumphal Arch and the Museum. For those who wish, there is a long climb to one of Petra's most spectacular tombs, the Monastery (El Deir). 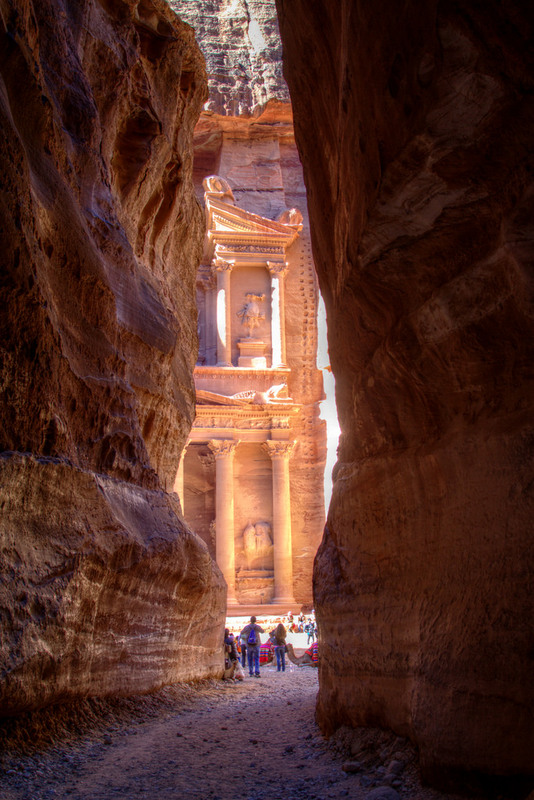 You will have free time for your own explorations of Petra. Second of 2 nights in Petra. Petra Moon Hotel or similar. Breakfast & Dinner. This morning we leave Petra and travel further south into the Jordanian Desert to visit Wadi Rum which was Lawrence of Arabia's base for his struggle against the Ottoman Empire during World War One. This afternoon we enjoy various activities in this extraordinary desert area, including a jeep ride into the canyons. Wadi Rum has red sand and towering sandstone mountains which rise vertically from the flat desert floor. You feel that you are walking on the floor of an ancient sea. The red, gold and brown mountains are like stacks of pancakes with melting butter and maple syrup flowing out between. This evening we enjoy our Bedouin dinner around a campfire with millions of stars twinkling overhead - far from the lights of any town. Like the Bedouin tribes people who live in this remote area between Jordan and Saudi Arabia, we sleep in the traditional black goat-hair tents. However, we have electricity, hot and cold running water and hot showers! This is a special opportunity to enjoy this remarkable place and the lifestyle of the Bedouin tribes people for one night - but with Western comforts! Our camp is located within the Wadi Rum Protected Area and so we learn about the animals and plants that struggle to survive in this sensitive desert environment. Day 7 Monday, February 11. This morning we leave the stillness of Wadi Rum, taking the fast Desert Highway back to Amman, and fly to Cairo ( NOTE: the cost of the flight between Amman & Cairo is included in our LAND tour cost). Today we include lunch in Jordan together. This evening, you are free to choose your own restaurant for dinner in Cairo. - Accommodation in 4 and 5 Star hotels in Egypt. All our hotels have en-suite bathrooms and air-conditioning. - 3 nights on Deluxe Nile cruise ship. Land and water transport by coach, taxi, felucca sailboat, cruise ship, horse-drawn carriage, and ferry. 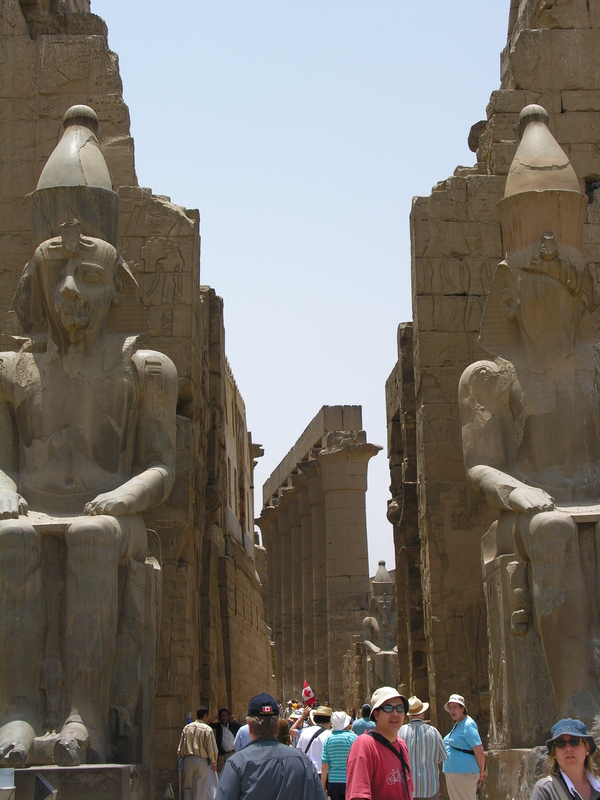 - Flights: Cairo - Aswan and Luxor - Cairo. - Sightseeing and entrance fees as mentioned in the itinerary. 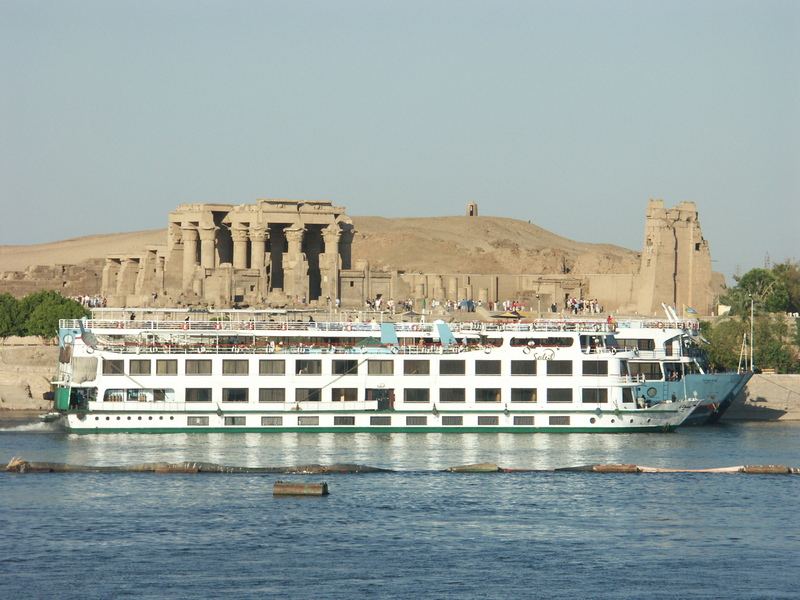 - Breakfast & dinner daily plus 3 lunches on Nile Cruise ship. 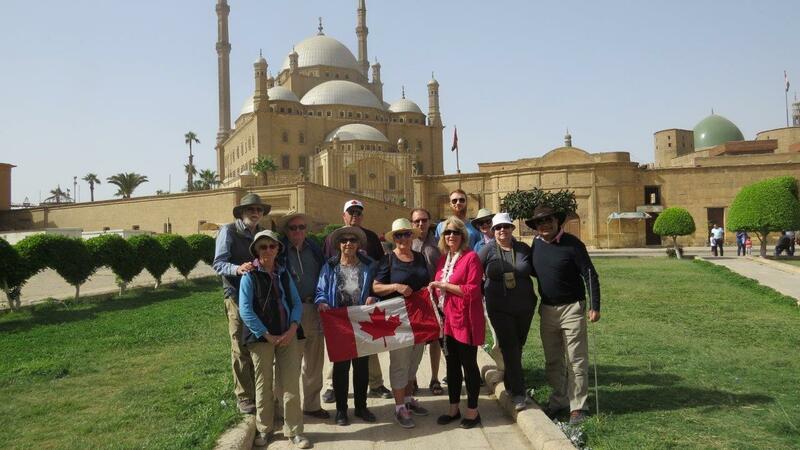 - Guiding by Royal Heights tour leaders Julie and Norman Bruce with the assistance of our expert Egyptian guides. - Lunches - except on March 8th and when aboard our Nile Cruise ship. -Porterage for one piece of luggage per person when available. Please make sure your luggage has wheels so you can move your own luggage when necessary. -Trip Cancellation / Interruption and Medical Insurance. We offer insurance coverage with Manulife Insurance. Please contact us for a quote. -Personal Expenses such as souvenirs, laundry, drinks not included at meals. -Arrival & departure transfers- please contact us for a quote. We can arrange individual or group transfers when we have confirmed the arrival & departure times of the flight. If you wish to be guaranteed a single room, there is a Single Supplement charge of $800 (Egypt only) & $1,360 ( Egypt & Jordon) Our price is based on 2 people sharing a room. Those people traveling alone but wishing to share will be informed 3 months prior to departure if a roommate is not currently available. At that point, you will be invoiced for the Single Supplement. If a roommate subsequently joins the tour, your single supplement will be refunded with the final documentation. -Sound & Light showS at Philae (in Aswan), Karnak (in Luxor) and at the Pyramids in Cairo. -Hot air ballooning in the Valley of the Kings. Land portion of the tour must be booked directly with Royal Heights Tours. You can secure your place on the tour with a $400 per person non- refundable deposit. We take payment by cheque, Visa or Mastercard for the $400 /person deposit. The invoice for the Land tour will be sent in early November 2018. Payment will be due early December 2018. Price quoted is for FINAL PAYMENT by cheque. Should you wish to pay the outstanding amount for the LAND tour by credit card there will be an administration fee of 3% on the outstanding amount. -Our office staff are not medically qualified to advise you on which immunizations you require. Please consult your local travel health clinic. -This tour not suitable for those people who need walking/mobility assistance in the form of walking sticks or canes, as we walk on a lot of uneven surfaces.